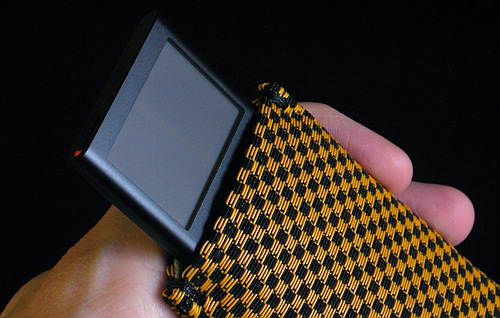 OhGizmo Review – WaterField Designs iPod Cases | OhGizmo! Whether you’re a fan of the iPod or not, one thing you have to admit is that there are a lot of accessories available for them. In fact ‘a lot’ is a bit of an understatement given how prolific third party manufacturers have been with producing anything and everything one could ever need for their iPod and in every color under the sun. It’s probably one of the reasons a lot of people hate the iPod as finding accessories for non-Apple MP3 players is almost impossible. So instead of fighting the current, today I’ll be ‘going with the flow’ and looking at three iPod-specific accessories from WaterField Designs. 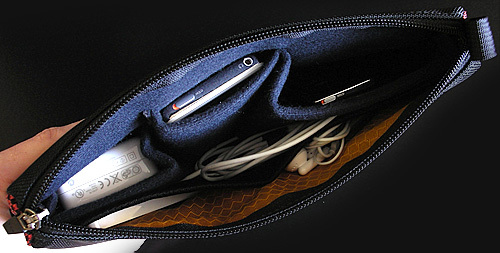 The Nano and Video cases are designed to provide a safe way to stash your iPods away when not in use while the Large Gear Pouch is a handy way to keep power adapters, USB cables, FM transmitters and whatever other accessories you feel the need to carry with you organized and easily accessible. So if you’re a fan of the iPod but are still looking for a good way to protect your investment please read my full review of WaterField’s offerings (with many additional pics) after the jump. However if you prefer to support that up-and-coming startup known as Microsoft and their Zune player instead then you might just want to move along to our next story. First off I’ll get it out the way by saying as much as I love the iPod UI and as nice as their players look they still scratch far too easily. In fact as I was taking the original iPod Nano out of the box I think I squinted too hard at the screen and subsequently caused a scratch to appear. So needless to say already being a guy who likes his toys to stay in pristine condition I’m pretty fanatical about my iPods. Now whenever I’m listening to them I prefer to carry them bare but when it’s time to go in the shoulder bag or backpack they definitely get stuck inside a case of some sort to keep those scratches and nicks to a minimum. 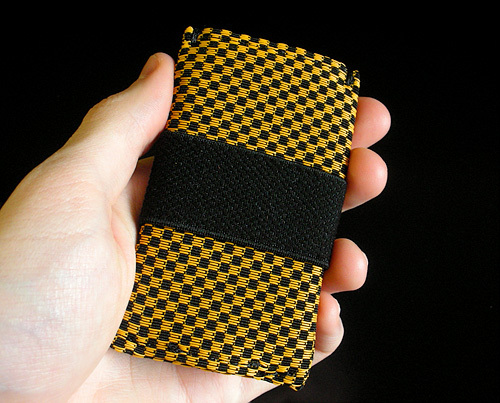 I was sent the WF iPod Nano Case in what they call the ‘Taxi’ color scheme which is essentially a black and yellow checkerboard pattern. Of all the colors they offer it’s definitely the one I prefer since it easily stands out when buried in a pile of other gear inside my bag. However if it looks a bit too bright for your liking WaterField Designs also offers them in blue, celeste (light green), lead and checkers (red) colors. I have to say I’m a big fan of this simple addition because I always spend the first 2 or 3 minutes of using my iPod just untangling my headphones which were simply crammed into my pocket or bag after the last time I used them. Even though I do take the time to loosely wind them up it seems to add to the tangling problem rather than alleviate it. With my headphones tucked under this strap they come out just as organized and untangled as when I stuck them in there. 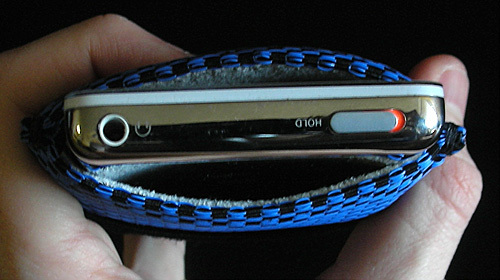 At one end of the case you’ll find the wide opening where the iPod Nano can be inserted. The inside layer of the case is a cushiony neoprene with a no-scratch liner that I feel completely safe about sticking my iPod into. It definitely will not scratch up the finish in any way. Now this brings me to the only major issue I have with the WaterField Designs Nano case and that’s the fact that you can’t control the iPod or see the screen while it’s in the case. Like I mentioned earlier it’s not a big issue for me since I carry my iPod bare when listening to it but anyone who wants protection while still having access to the screen and scroll wheel will have to look elsewhere. Unless of course you have no problem with constantly inserting and removing your iPod into the case every time you want to adjust volume, skip songs or see what artist is playing. However if you’ve invested in the iPod remote this is probaby a non-issue for you as well. At the other end of the case is another opening (albeit far smaller) that is designed to provide access to the charging/sync port on the bottom of the Nano while it’s inside. This can be handy to have I guess but unfortunately it left me scratching my head a bit. You see the case came with an instruction sheet showing how to properly insert the Nano with the screen facing to the opposite side of the elastic headphone loop and oriented so that the hold button would be acessible via the larger opening as pictured below. That’s all fine and allows the sync port to be accessed through the smaller opening but pretty much means you’re not going to be listening to any music with this orientation since the Nano’s headphone jack is located on the bottom of the player which is now buried in the case. However poking around the WaterField Designs’ website I’ve found photos of the Nano case with the iPod inserted in the other direction giving access to the headphone jack and sync port through the large opening so I guess it’s designed to be flexible depending on how you want to use it. One last thing I want to mention is that the Nano Case provides a very snug fit for the iPod when it’s inserted. While it means the iPod is not accidentally going to fall out at any point it also means that removing the Nano from the case can be a bit of a challenge. The included instructions suggest pinching the bottom of the case to pop the Nano out which didn’t really work for me. However their alternate suggestion of sticking your finger through the smaller hole on the bottom to push it out seemed to work a lot better. A minor issue of course but something I wanted to mention. Overall the WaterField Designs iPod Nano Case provides more than ample protection for your hardware with a minimal amount of added bulk. However unless you rely solely on the Apple iPod remote for controlling your iPod then this case is not really designed to be used while your Nano is being listened to. But as an added layer of protection for the Nano while it’s bouncing around inside a backpack or shoulder bag this case works quite well. + Well made with high-quality materials. + Soft material lining the inside of the case will not scratch the iPod. + Clean design with no logos or branding. + Convenient elastic band to hold headphones secure when not in use. + Reasonably priced ($22) and available in a small but stylish selection of colors. – iPod’s screen and scroll wheel are inaccessible while in the case. – Snug fit means the iPod can be a bit hard to remove from the case in a hurry. Besides being obviously larger in size the WaterField Designs case for the iPod Video is pretty much exactly the same as their one for the iPod Nano so there’s not a lot that’s different to be said about it. However there are a few things I want to point out. I was sent the WF Video Case in their Blue color scheme and as you can see it looks pretty much like the Nano version with the black elastic strap appearing on the side for securing your headphones. And if you’re wondering the Video version is available in the same colors as the Nano version is. You’ll notice the one major difference on the Video Case is that the side opposite the elastic headphone strap has a large black section that’s made from a sort of rubber/microfiber fabric that’s there to provide an extra bit of grip on the case while you’re carrying it. Whatever the material is it works quite well and the case is not going to go flying out of your hand at any point due to lack of grip. 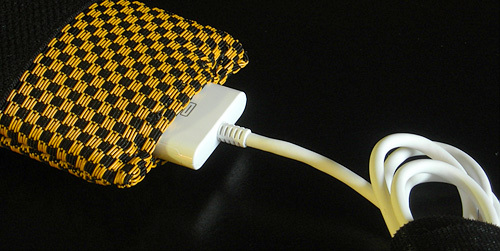 (Perhaps Nintendo can start finishing the Wii controllers with this fabric too?) Like the Nano version the Video case also has a layer of plastic under the outer material to give it some stiffness and additional protection for the iPod inside. You’ll find the same 2 openings that the Nano case has on the Video case including a wide one on one end for inserting the iPod Video and a smaller one on the other end that can be used to attach the USB sync cradle while the player is still in the case. The one advantage that the iPod Video has over the Nano is that the headphone jack is located on the top of the player alongside the hold button which means when the iPod Video is inserted in this case the sync port, headphone jack and hold button are all accessible at the same time. I also wanted to mention that unlike with the Nano version removing the iPod Video from this case is pretty easy since the size allows the material to flex enough to easily get your fingers into the large opening and pull it out. As much as I hate to keep referring to what I’ve already said in the Nano section of this review since the cases are so similar in design and functionality what I said for the Nano applies here too. 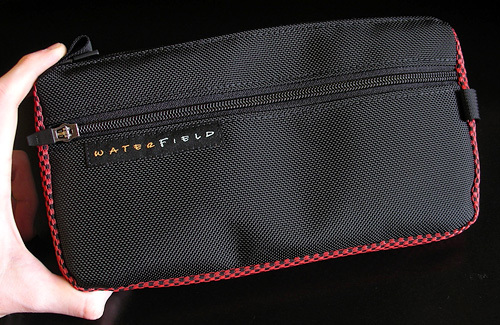 If you’re looking for a case that provides plenty of protection without a lot of extra bulk you can’t go wrong with what WaterField Designs has created. Just keep in mind unless you have the Apple remote you won’t be able to control your player while it’s inside the case. + Reasonably priced ($29) and available in a small but stylish selection of colors. + Easier to remove the iPod from this case than the Nano version. Even though Apple has included less and less accessories with every new iteration of the iPod I guarantee most long-term users will have more stuff than they know what to do with. I’m talking about things like power adapters, USB or Firewire cables, docking cradles, FM transmitters and even small portable speakers. Now on a normal day you don’t need to carry all these items with you and they can remain scattered in drawers and across your desk at home but there are other times like when travelling for example where you need to carry along a lot more than just the iPod itself. For those times it’s always nice to have a case of some sort to easily bring everything with you. Let’s face it you probably already have a case for your digital camera and its extra bits or one for your NintendoDS plus games and charger right? Then why not one for organizing your iPod stuff too? As you can see black ballistic nylon is actually the predominant material used on the Gear Pouch with the red ‘Checkers’ fabric only appearing as an accent around the edge. Like everything else from WaterField Designs it makes for a nice finish giving it some color without being garish at all. I will mention though that unlike the iPod cases the Gear Pouch has little padding or the layer of hard plastic on the inside. While this can be considered a downside it helps keep the size of the pouch to a minimum especially when it’s packed full of gear. Of course I always feel the need to point out any logos or branding and on the front of the Gear Pouch you’ll find a small patch bearing the WaterField Designs logo which is thankfully understated but still present. Perhaps one day manufacturers will provide a slightly more expensive version of their products that come logo free? And the versions with the logo included could be considered ‘ad-supported’ which in turn would reduce the cost a bit. Yeah I know… not gonna happen. 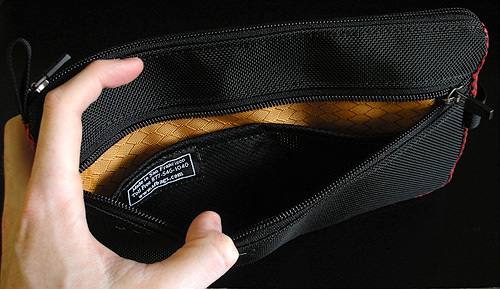 Just above the logo on the front of the pouch you can see a zipper which opens to reveal a large pocket on the outside. The fabric in here is the standard WaterField Designs yellow with a gold stitched pattern which not only looks really nice but also makes finding things inside the case very easy since you’re not staring into a black hole. You’ll also find a large mesh pocket in here that has been stitched down the middle dividing it into 2 smaller ones that work great for holding either of the iPod Shuffles. 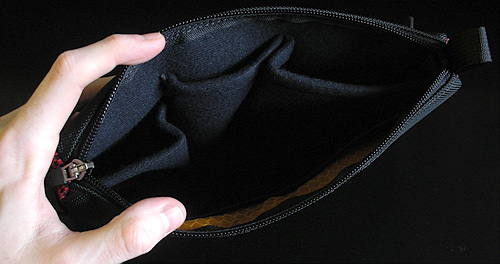 However since the pocket itself is pretty flat it’s more suitable for storing cables, earbuds or anything else that can also lie flat. On top of the case is another zipper that opens to reveal the main compartment of the Gear Pouch where most of the high-tech stuff is supposed to go. 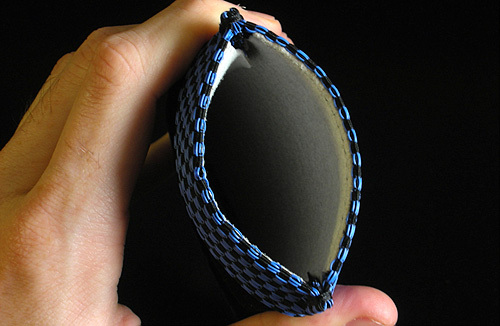 On one side you’ll find another divided mesh pocket and on the other you’ll find a set of 3 loops (I say loops because they have no bottom) in varying sizes that are made from a very soft material. 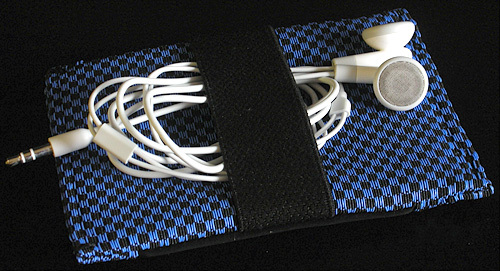 These loops are designed to secure your iPod(s) and other larger accessories but also protect them from bumping up against anything else floating around this compartment. Now from what I can tell the loops aren’t padded but the material used is very soft and has some give to it which will help protect things inside. As you can see there’s plenty of room inside the pouch to fit quite a bit of stuff. I’ve got most of the gear I normally travel with packed inside and it’s still nowhere near close to being full. 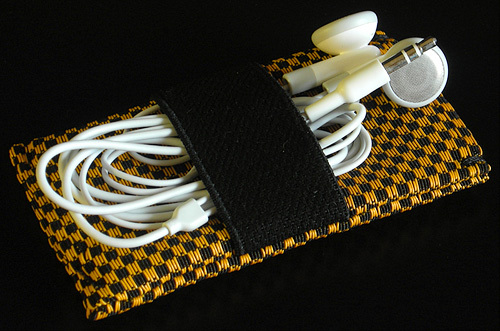 If you’re a neat freak like myself that likes to have everything in order (especially when travelling) then the WaterField Designs iPod Gear Pouches will make sure your power adapters and spare headphones don’t go missing when you need them the most. And I also want to mention that unlike the iPod cases the Gear Pouch can really be used to store anything like a small P&S camera with its accessories or dare I say it even a Microsoft Zune if the iPod doesn’t do it for you. + Soft material lining the inside loops will not scratch the iPod. + Minimal branding with only a small logo on the outside. + Generic shape and pockets handy for storing other electronics too, not just an iPod. – Lack of padding means less protection for what’s inside. If you have any further questions or concerns about the iPod Cases or Gear Pouch you?d like answered please feel free to leave them in the comments section and I will try to respond to them as best I can. This mini bag is awesome. I think I am going to nail me some sort of a replica, if this bag is not available in my country. Thank you for sharing this wonderful mini bag with me ! Those mini bags look great, might well consider to get one next to my iBlaze I just got. Now I am complete set for the great outdoor over Christmas. Thanks for the very detailed review – saves me time to look around. Omfg, who ordered the bible-full of bag pictures?